This is a prolog to the site above. Check out the site for full details on CITES. CITES (the Convention on International Trade in Endangered Species of Wild Fauna and Flora, also known as the Washington Convention) is an international agreement between governments, drafted as a result of a resolution adopted in 1973 at a meeting of members of the International Union for Conservation of Nature (IUCN). Its aim is to ensure that international trade in specimens of wild animals and plants does not threaten their survival and it accords varying degrees of protection to more than 33,000 species of animals and plants. In order to ensure that the General Agreement on Tariffs and Trade (GATT) was not violated, the Secretariat of GATT was consulted during the drafting process. Only one species protected by CITES, the Spix's Macaw, has become extinct in the wild as a result of trade since the Convention entered into force in 1975 (but see case studies in Hutton and Dickinson and Stiles for further discussion of the role CITES has played in the fate of particular species). Tony, Which Louisiana Critters have to have cites tags and how do you get them? 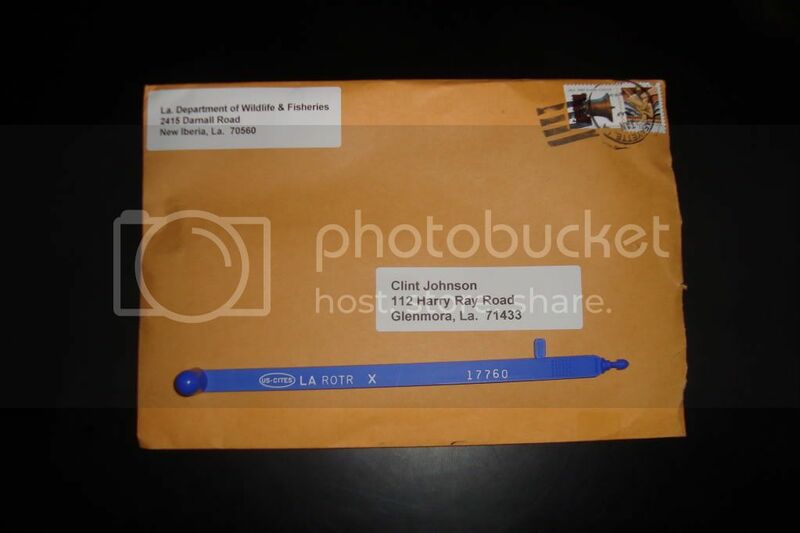 Robert otter and bobcat have to have cites tags if they are shipped out side the state of Louisisan. Everything else just requires a shipping tag. You can call LDWF in New Iberia La at 337-373-0032 and ask for possession tags. They will take down your address and ship you as many possession tags as you need. Once you have the possession tag, you fill it out with the information needed and return it to LDWF New Iberia Office, 2415 Darnall Road, New Iberia 70560. They will then send you a CITES tag with paper work that you have to sign and return stating the you received your tag. If you don't sign and return they will not issue you any tags of any kind till that paper work has been returned and I am sure if they had to, they would send someone out to get your John Hancock. ;D It is a long drawn out process but it works and that is all that matters. I have a question.Would I need to have a CITES tag on a bobcat fur that I would sell in Louisiana? Garett,if you sell to a fur buyer in Louisiana,they will have the possession tags and you will only have to provide the necessary information to them,your name,trappers license number,and parish of the catch.You do not have to have a Cities tag,unless you wish to ship out of state,if you cross a state line with a bobcat or otter,you must have a Cities tag on it,federal law. How long does this process take? I mean without knowing exactly how many bobcat/otter you are going to catch you have to wait till your done trapping to call. Then wait on tags before shipping to auction. Order enough possession tags so you have enough. Then send in the possession tags of the otter and cat you catch. Take about a week to seven working days most times.